The integrated HV-transformer produces an alternating current of approx. 7 – 8 kVAC. The main on/off switch with a build-in display light, always lets the user know that the power pack is ready for operation. 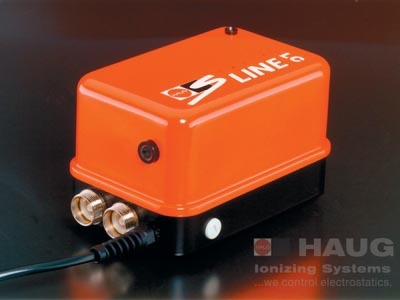 The S-Line power pack works ideally with HAUG ionizing products, such as ionizing bars, air gates, ring ionizers etc. As EN SL, but with integrated full-electronic function monitoring. This system constantly monitors all functions of the ionizing system without any further measuring or test equipment. It alerts the operator of any irregularities by causing the LED indicator integrated in the housing to flash. Identical in all technical aspects to the EN SL LC, the EN SL RLC power pack comes additionally with a signal socket above the earthing sleeve. A fault message can be connected to the signal socket. The maximum contact load is 24 VAC / 35 VDC and max. 50 mA (see contact scheme and logic diagram). In unit EN SL SD: Contacts 4. 5. 6 for reset and excess temperature switch-off identification. Design identical to power pack EN SL RLC. This power pack additionally monitors the following error states: spark-over, high-voltage short circuit and excess temperature. The signalling socket allows the power pack to be monitored and controlled. The rounded edges of the S-Line housing prevent the operator from risks and injuries. With help of the HAUG vario holder all S-Line power packs can easily be mounted horizontally on any flat surface or vertically right to the wall. The S-Line power pack is manufactured in accordance to the DIN 0550 norm, protection type IP 54, protection class I.
HAUG’s patented plug-and-socket connection System X-2000 ensures the installation to be fast, simple and without the requirements of any tools. max. connectable length 5 m.
max. connectable length 10 m.
Relay-LED-controlled with extended function monitoring for sparking, HV short circuit and overheating with switch-off. Reset on unit by remote control, max. connectable length 10 m.